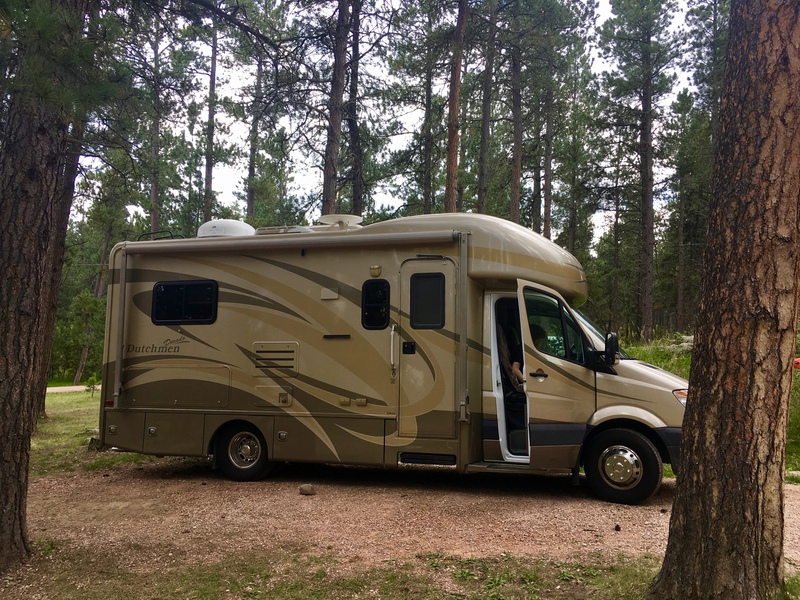 Rapid City Pumpkin Festival and Crazy Horse Volksmarch plus a Little Golf and Wine – RV There Yet? Hello again! This past weekend was full of exciting activities. On Saturday, we met Bob’s daughter, Halie and grandson, Kieran to go the Rapid City Pumpkin Festival. Several fun events were held, however it is impossible to fit all of Rapid City and surrounding areas in Main Street Square. Rapid City event planners-are you listening? We don’t all fit. Spread this event out!! Similarly, I heard the Weiner Dog Races in Deadwood were equally crowded and impossible to see. I have never planned a large event in South Dakota but I definitely have attended them-cue Spearfish Art Festival/Hills Alive/Downtown Friday Nights. In my unofficial opinion, what the Rapid City and Deadwood events need are MORE SPACE or MORE GRANDSTANDS/BLEACHERS for the masses of people. Thank you for planning fun events anyway. A for effort, and I mean that. On a more positive note, we did see (kind of) the School of Mines Pumpkin Catapult event which was well worth the drive. We also witnessed up close and personal the home grown pumpkin of Reed and Justin Fossum. Kieran appeared to have a good time, liked his train ride, loved his balloon, and it was a beautiful day to spend time with our family. The beautiful day continued with 9 holes of golf at Elkhorn Ridge Golf Course, home of the friendliest staff in the Black Hills. The course has the most blind spots of any course I have played, but also has breathtaking views. As always, I had some amazing hits. Unfortunately, most of them were on different holes-bringing my score to the 50s???? Just kidding, I never know the actual number as my score is a consistent par-ish (that’s what I call anything close to par). Also, if I am too far away from par I erase the terrible shots-let’s be real, nobody wants to count those anyway. My sweet husband does usually keep score and almost always beats me. My favorite golf quote from my favorite father-in-law is this “You are never going to get better, Sara, if you only play a few times a year”. Thank you for those words of affirmation Jack, I still love you and I’m still not better! Although this is one of the largest Volksmarch events in America, it isn’t that crowded. The hikers spread out throughout the day and it is very enjoyable. DON’T BRING YOUR KIDS IN A STROLLER!!! Sorry for yelling but Alicia mentioned this in her article and the kind volunteers also mention this at the start line and yet parents just aren’t listening. You will most likely ruin your stroller and your child could end the hike with shaken baby syndrome. Ok, not really, but it is very steep and rocky terrain. Bribe your children with snacks at the beginning of the hike to be eaten at the top. This is actually a tested trick, on my then five year old son, and it worked. It didn’t, however, work to get him to hike this year at age thirteen. We are very fast hikers and by we I mean Bob. We finished the hike up in about an hour, but it isn’t the easiest hike in the hills. That being said, my first Crazy Horse hike ever, I was passed by a hiker, missing one leg, on crutches as I was complaining to my sister about my sleeping baby on my back. Moral of that story: just do it. It’s well worth the view. Crazy Horse Volksmarch 2018 is June 2 and 3. See you then. They are both reds, the first is dry and perfect and the second is a little more sweet. They probably both have hints of Oak or Pine Needle or something else found on the ground, but I’m not cool enough to know any of that so read the descriptions in the links I provided. The food at Prairie Berry is also wonderful. We just ordered a cheese plate as it was 1:30 in the afternoon, but if you are wanting a meal-the grilled cheese or flatbread pizzas are delicious. *All of these events have RV parking or are RV friendly. We didn’t take ours to any of them because that would have been a little weird since we live here and we weren’t camping. Thanks for reading! !